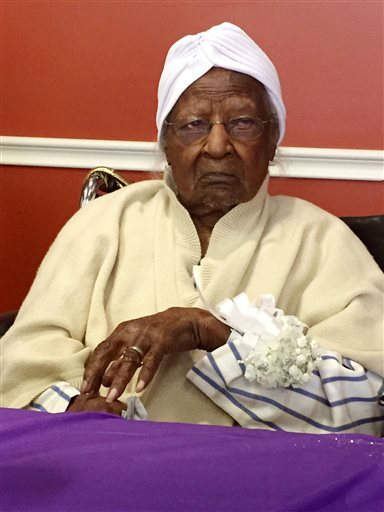 DETROIT — A woman deemed the world’s oldest person died in Michigan, about a month after her 116th birthday. Jeralean Talley died yesterday evening at her home in the Detroit suburb of Inkster, according to her daughter Thelma Holloway. Holloway said today that her mother was recently hospitalized and treated for fluid in her lungs before returning home “just where she wanted to be”. In this Thursday, May 21, 2015 file photo, Jeralean Talley, born on May 23, 1899, is honoured at the Inkster, Michigan district office of the Michigan Department of Health and Human Services. Talley turned 116 last month. She celebrated at her church and a local office of the Michigan Department of Health and Human Services. Attendees at the second event included US Representative John Conyers. The Democrat is the longest serving member in the House, but even at 86 he was still three decades younger than Talley. The Los Angeles-based Gerontology Research Group considered Talley to be the world’s oldest person, based on available records, followed by Susannah Jones of Brooklyn, New York. The group said Jones turns 116 in July. Talley was born in Montrose, Georgia, in 1899 and moved to Michigan in the 1930s. Talley’s husband died in 1988 at age 95. Talley’s hobbies included bowling until she was 104, and she went on an annual fishing trip until shortly before her death. Holloway said her mother also enjoyed spending time with “her little baby”, a two-year-old great-great-grandson.